In the last couple of years there is a particular growth of Photographers in India. While there is lot of talent, what really makes Venkat stand apart is, along with his immensely successful photography business he also teaches and shares his talent through Photriya Photo workshops. I have met so many people who perceive passion as their careers, but most of them aren’t willing to share or spread their talent for the fear of loosing their business.I truly admire Venkat for sharing his talent and teaching everyone on how to capture the most beautiful photographers. He is a true artist. While he is extremely busy with his photography and maintains his super popular Facebook page, he very generously spoke to me and gave us some pro-tips on how to look good and take great pictures. Read on..
Venky : Be prepared. If you are the photographer, prepare your subject for the photo. It is very important to be ready for the picture. If you are ready, even if you just woke up you will look good in the pictures. Why do everyone look good in a selfie? Because they are prepared and want to look good. It’s the most important. BV: How to deal with people who are stiff and uncomfortable with camera? Venky: Candid shots work best for them. But some times it may be challenging to click at the right time if you are not a professional photographer. In that case it is very important to talk to the person, make them comfortable and click in the process. Venky: If you are not a professional photographer, it can be challenging to capture that precious moment with the babies. They are always moving. It’s best to use Burst mode, or continuous shooting mode,to shoot a series of photos one after the other. BV:Most challenging and important thing while using a DSLR, point and shoot or just iPhone is finding a right light, How to find perfect lighting, what is the best time of the day? Venky: Best time for pictures is during Sunrise and Sunset,6AM to 9AM and 3PM to 6PM.That’s when you get soft muted light which is perfect for pictures. Other times during the day Sun is over your head, bright and harsh. It causes strong shadows which is unflattering for many subjects. Any time of the day, it is very important to choose the right background for the subject to look good. That also again depends on the light, background should never have more light than the subject. BV:How to make most of the minimal lighting and take decent pictures at parties and indoors using a basic camera or a phone? Venky: Always look for a light source, like a tube light on the wall. Make sure you are facing the light and the photographer is standing by the light. BV:Everyone wants to look thinner in pictures, any tricks and tips to look little more leaner? Venky: Work with an angle, always take pictures at a slight angle. Face facing the camera and shoulders and hip slightly turned at an angle will work best for women. Never take straight angle shots on some one who is healthier. Also, clicking from total low angle or top angle may also make some one look few pounds heavier. Always click from mid- angle. Shoot from further away and use a longer focal length. Wide angle lens or a zoom lens can make people look few pounds heavier. Wearing darker colors and body con clothes also helps. BV: Are there any favorite colors,that always look good on camera? Venky: I think any bright colors like Red, Pink, Violet, Green, Blue. Anything that is bright. BV: Do you have a favorite photo editing app on your phone? Venky: I like Photoshop app on my phone. BV: Are you on Instagram? What is your favorite filter? Venky: I am, you can follow me here, I don’t have a favorite filter, I mix things up. Venky 😀 the awesome person! i love photography sorry i live for photography…. which camera is better for beginner? Spclly d light efcts n d mind setups of d clint…..
Thnx fo shrng ur exp hear…..
“Photography is the art of seeing what seems invisible to the eyes of others. It is to see beyond physical eyes, to connect with the eyes of soul, and to immortalize a moment forever.”…This is what i observed in VENKY PHOTRIYA PHOTOGRAPHY..
Bro ur photography was very impressive..
Super Ji, I like your photos, it’s really awesome and I love em the way you take it, I’m learning verything from you. 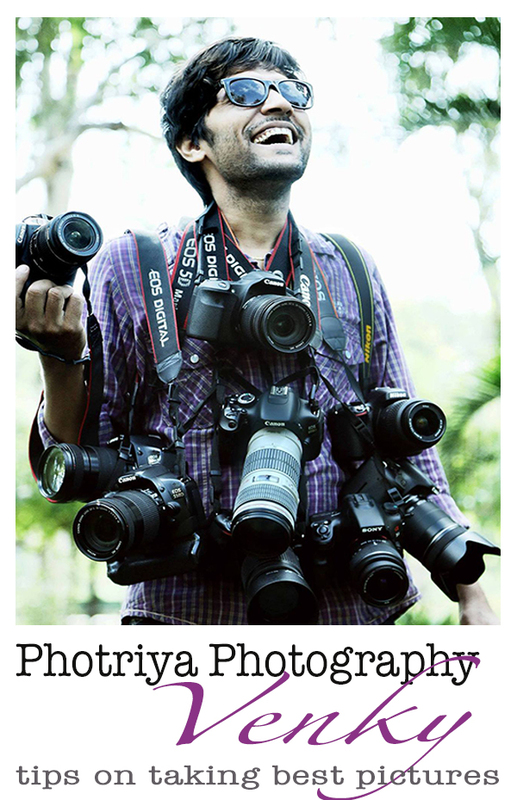 do you have any online photography classes..venky….? I want to buy new camera which could you suggest me. Whats the cost to shot for Marriage. Is there any package or how to contact please let me know. Marriage is on April 22 and 23 in bangalore . 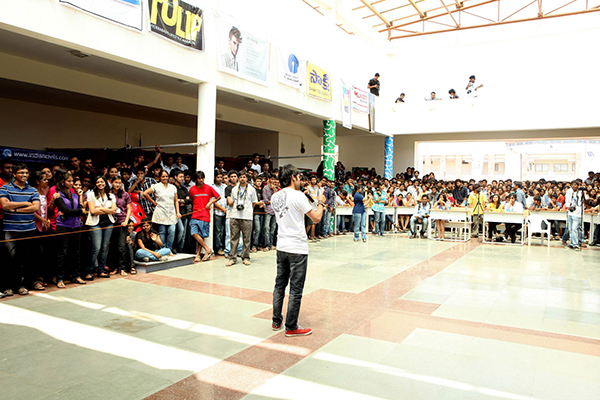 Plz lemme know if there are any workshops held at Bangalore.